Looking for that new audio/video cable that will go anywhere or connect any device? 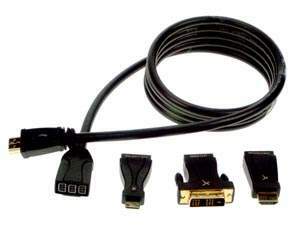 This cable will allow you to connect a standard HDMI® port to a standard HDMI®, a mini HDMI®, or DVI port. Now legacy Cable boxes, New TVs, computers, camcorders, and other mulitmedia devices can be used together without carying multiple cables. This High Speed HDMI® Cable with Ethernet has a HDMI A Male connector permenantly mounted to one end of the cable. The other end of the cable has the QuickConnect® system on the other. The tips that are in the kit are: 1) Standard HDMI® Male 2) Mini HDMI® Male 3) DVI Male.